Please join us. We will have new and updated information about the Steiner Ranch Area Emergency Evacuation Plan. You will have an opportunity to review the information and provide comment. The meeting will be an open house format so you may come-and-go at your convenience. Thank you for your interest in this Steiner Ranch area safety project. 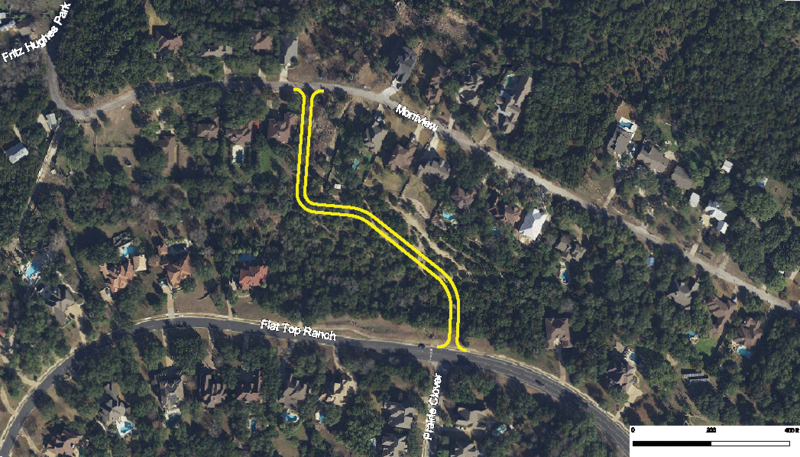 The Steiner Ranch Area Evacuation Route Design is a capital improvement project proposed to provide an additional evacuation route out of the Steiner Ranch area neighborhoods. This project is located in Travis County Precinct Two. The proposed funding is by 2017 Certificate of Obligation bonds. Work with the community to balance needs, priorities and constraints to develop a feasible option that enhances safety and reduces evacuation time for the area. During an emergency event, the emergency route will be used and controlled by First Responders. Routes which are considered higher in ranking provide flexibility for First Responders, do not require a taking of residential property, reduces evacuation exit time and will move more evacuation traffic than existing, Evaluation Matrix. The emergency route will consist of two (2) travel lanes. Any routes that may cross the Balcones Canyon Land Preserve are not a consideration for this project. Balcones Canyon Land Preserve lands (BCP) are federally protected lands that cannot be crossed with a road and cannot be developed in any way. All BCP lands are shaded in green in the attached map for reference. Crossings over Lake Austin were ruled out due to extreme costs and terrain issues. (there is a large bluff on the south side of the river that makes any bridge structure extremely tall and too costly). Furthermore, these crossings must also cross the BCP lands, which as indicated above is not allowed. Join our mailing list or contact the project team by sending us an email. Travis County wants to hear from residents and business owners who live, work and play in the Steiner Ranch neighborhood area. If you have any questions or concerns regarding the project, or would like to be included in project email communications, please email SteinerRanchEvacRoute@gmail.com. Open house is scheduled for April 18, 2019. Want to send comments or ask questions about the project? Please email SteinerRanchEvacRoute@gmail.com. View PDF version of anticipated timeline. Proposed funding is by 2017 Certificate of Obligation bonds. Click on the links below to read recent news releases for the Steiner Ranch Area Evacuation Route Design or other construction projects in the area.